Dr. Aichi Chien, winner of The Bee Foundation (TBF) 2015 Research Grant Award, is an Associate Professor in the Division of Interventional Neuroradiology at UCLA, and holds faculty appointments in in the NIH-Funded interdepartmental graduate program of UCLA Biomedical Physics and in the UCLA ACCESS/Bioscience Interdepartmental Program. Her research encompasses the computational analysis of intracranial aneurysms and novel algorithms to analyze clinical images. I am passionate about helping people be healthy and understand more about their own health. I reach this goal through research and education. I am very lucky to be in a profession which lets me do just exactly what I like. Why did you get involved in field of brain aneurysm research? I was recruited by the Brain Aneurysm team in UCLA Interventional Neurology before I completed my PhD because of my expertise in human blood flow and blood vessel properties in 2006. This is the team that invented GDC (the first detachable aneurysm treatment coil). I was asked to develop a blood flow analysis system to help identify which unruptured aneurysms need to be treated. It was challenging because very little is known about brain aneurysms. I was young and ambitious, and wanted to work in an important field as a fresh PhD graduate so I took the challenge AND I’m still working on it now. What is your grant for? This grant is to study a group of brain aneurysms which have been clinically followed for years. Among these aneurysms, some grew, some are stable, and some unfortunately ruptured. We will study the changes of these aneurysms in detail and establish a database which records all the changes in these aneurysm over the years, such as shape changes and blood flow changes. This data will allow us to understand the risks of leaving aneurysms untreated. I should emphasize that less than 5% of aneurysms rupture; therefore, some aneurysms do not need to be treated. However, our knowledge of which aneurysms are at risk, and whether a low risk aneurysm can change into a high risk aneurysm and how much time it takes for the risk to change is very limited. 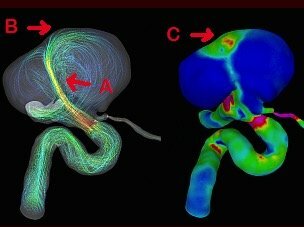 This research is trying to use detailed aneurysm analysis methods (blood flow and 3D morphology analysis) to answer these questions. How did you hear about The Bee Foundation? Are you excited to speak and present your research at the 2nd Annual Honey Bash? Very much!! I like to share what I know and being able to share with people who care about brain aneurysm research is an honor for me. What will the grant money help you to accomplish? This grant will allow us to collect data and perform the aneurysm study. This work is also an important foundation for future multi-center research to expand our knowledge and understand this field. In 45 Characters or Less – What message would you want the world to know about brain aneurysms? Brain aneurysm rupture is a serious and dangerous situation. Although rupture can be prevented, less than 5% of brain aneurysms rupture. We need to know which aneurysms need preventative treatment because the treatment has risks, too. 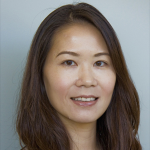 Dr. Chien is an Associate Professor in the Division of Interventional Neuroradiology at UCLA, and holds faculty appointments in in the NIH-Funded interdepartmental graduate program of UCLA Biomedical Physics and in the UCLA ACCESS/Bioscience Interdepartmental Program. Her research encompasses the computational analysis of intracranial aneurysms and novel algorithms to analyze clinical images. Dr. Chien has extensive experience with aneurysm clinical research and aneurysm image quantitative analysis and a demonstrated record of productive research integrating morphology and hemodynamic analysis into aneurysm research. Dr. Chien has a BSc from National Taiwan University in Bioindustrial Mechatronics Enginerring, an MS from Cornell University in Mechanical/Aerospace Engineering, a PhD from the University of California in Biomedical Engineering and a Postdoc in Interventional Neuroradiology from the University of California.